Conscientiously: Quality is a bad word? Quality is a bad word? If you think Walmart has bad quality items, Cambodia's inexpensive footwear and backpacks are ridiculously cheap - using both meanings of the word! They make Walmart's items almost worth buying...not really, but you get the point, right? We were given about 20 backpacks that some gracious organization bought in Cambodia for us. They are so cute, little Angry Bird plastic backpacks, soooo cute until they started breaking within 2 weeks. A strap here, a zipper there. Ah, well, what can you do. Shoes are another source of anguish. Mostly the kids 4th grade and under do not wear shoes. It's like it's acceptable for them to run about everywhere barefoot because they are kids. Young adults and adults on the other hand ALWAYS wear shoes and when I zip over to the kitchen or playroom without bothering to slip on my flip flops, it never fails that someone will ask me "Did you loose your shoes?" I guess going barefoot when you are older is reserved for Monks and impoverished street people. Isabel went to the primary school with one of our staff to see it and since they went unexpectedly, she didn't go to the dorm to get her shoes (although she mostly wears them). When they entered the classroom, the teacher asked her to come back the next day to teach an English class to the 6th graders. As he glanced down at her uncovered feet, he mentioned "Tomorrow when you teach, you can wear shoes." 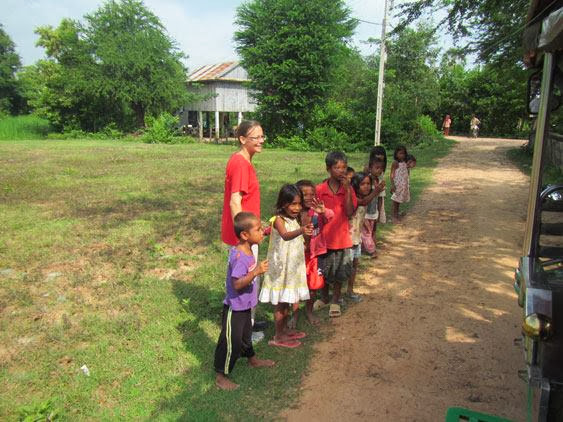 One lazy afternoon, I decided to walk down the road with a handful of our shoeless kids. Everyone had them not to long ago, but they either broke or were lost and the little ones said their teachers want them to wear shoes to class, so away we went. Mission accomplished for the boys so it was time to head home. The girls are a little more particular about their footwear and unfortunately, like everywhere, female attire is more expensive. I wouldn't let them buy the shoes they wanted because they are more fashionable than durable. Cute little bows, lace and accessories probably wouldn't have stayed intact for more than a few days. They will have to wait and go to the 'big' market to get theirs.